Mohammed Al-Fahim’s biography, ‘From Rags to Riches’ was first published in 1995. By the time he wrote this illuminating story, Al-Fahim was an eminent, highly respected Emirati businessman in Abu Dhabi and Dubai. As he skilfully weaves the personal perspective of his family’s adaptation from primitive living conditions—water carried home in goatskin bags from the well; sleeping on the floor or roof top; never having seen an electric light or running water till he was aged 13—he chronicles the arrival in Abu Dhabi of the first sterilisation plants, telephones, generators, a Dakota landing on the sand, a post office and a brick school. His reverence for the close family friend, Sheik Zayed, emerges clearly, a grateful tribute to the Emirati ruler’s careful and enlightened guidance of his people over fifty years. When the British pulled out of the Trucial States in 1968, Sheik Zayed’s tireless efforts led hostile tribes to agree to federate: the United Arab Emirates came into being three years later. Up into the 1950s, during the searing summer months, the coastal sand flat on the Persian Gulf was a village of a few thousand pearl divers, fishermen, boat captains and souk traders who lived in date palm frond huts. Al-Fahim’s family stayed in the oasis town of Al Ain, returning to Abu Dhabi for the winter. During one of these gruelling seven day camel treks, both his grandmother and grandfather died from heat stroke. In 1962 Mohammed’s mother, aged thirty, died in childbirth. Al Fahim points out with bitterness that there was still not a doctor or medical facility in the township. Marine surveying, some helped by Jacques Cousteau, took place from around 1953. Finally oil was struck in 1958 and the first shipment left Das Island mid 1962. The first exportation of onshore oil took place in December 1963. By 1966 the state coffers overflowed with oil revenue. Sheik Zayed’s eldest brother, suspicious and wary, had steadily opposed development. Only when Sheik Zayed took control that year did development begin. With a roar. Within a few years, with roads, electricity, government administration, education, water supplies, phenomenal construction sites, Abu Dhabi surged out of the sand. Anyone visiting Abu Dhabi today must read ‘From Rags to Riches’. You will keep in mind the ‘historic’ 1962 photos of the tiny coastal sand flat village to shake your head in amazement at the soaring glass-plated towers, Emirates Palace, the Corniche, the tree and grass-lined avenues (irrigated by desalinated water and an army of workers), the university complexes, the famous-name medical facilities, the dome of the future Louvre, the Formula 1 circuit in town. And the shopping malls stuffed with world appliances, foodstuffs, clothes, jewelry. Whereas Mohammed Al-Fahim recalls the wonder of the boy at the first sight of sweets, sherbet and canned milk in a local store. At the first shower he took. At the first electric light. 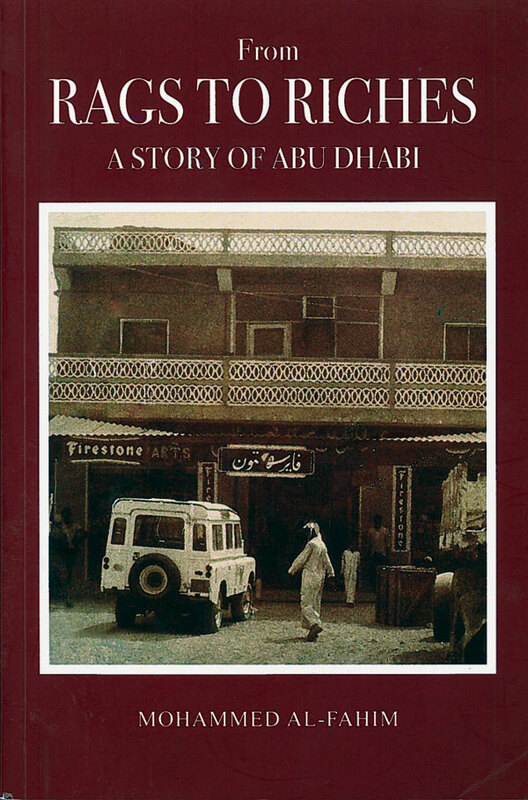 Visitors to the United Arab Emirates will gain insights from this well-written biography. But even more so, the third generation of Emirati, who live nowadays with fabulous wealth, facilities and opportunities. Their great grandfathers dived in dreadful conditions for pearl oysters. For this generation, the world is their oyster.